As a longstanding member of the Junior League (nearing Sustainer status!!! ), I am excited to spread the word about my DIAD group’s next event: Concussions, What You Need to Know. 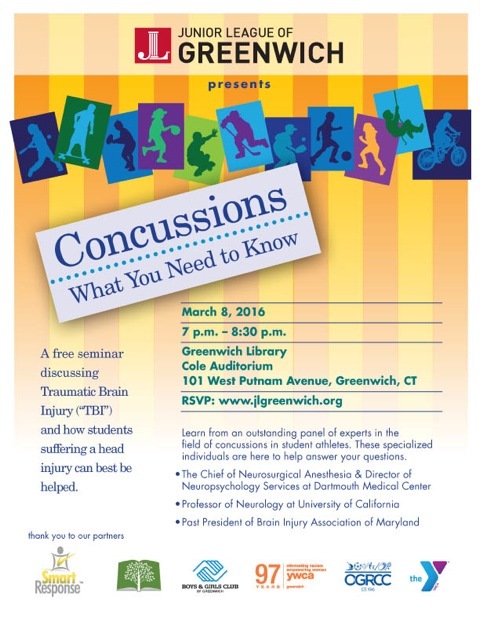 Our concussion talk will feature a multi-disciplinary group of brain injury experts curated by The Brain Trust. The panel will include medical experts from Dartmouth Medical School, an education professional from Maguire Associates, Inc., and a past president of the Brain Injury Association of Maryland. Why is it so important to enlighten the public? According to the Centers for Disease Control, each year, emergency departments in the United States treat an estimated 173,285 sports, recreation-related traumatic brain injuries (TBIs), among children and adolescents from birth to 19 years (CDC 2014). The panel of experts will provide essential best practices to prevent serious long-term consequences and return individuals to normalcy as quickly as possible after a concussion. They will review early interventions, the role of personnel in educational settings, and how individuals can help students suffering from a head injury. The JLG’s supporting partners for this event are the Old Greenwich-Riverside Community Center, the YMCA of Greenwich, the YWCA of Greenwich, and the Boys & Girls Club of Greenwich. Guests can register for this event by clicking here. Interested in learning more about or possibly joining the Junior League of Greenwich? Read more here or email/message me!